﻿ The Anne Harris Children's Fund: Welcome! Hi! My name is Merlin The Wizard. On behalf of Anne Harris, my friends and I would like to welcome you to the website of The Anne Harris Children's Fund. We hope you can help us raise money for children and in doing so, learn something, have fun and make friends! The money we raise will be donated to various charities and children mainly locally, to improve the quality of life of children and young people. For more information on making a donation or to make a donation, please go to our Donations page page. Hello and welcome to The Anne Harris Children's Fund. In 2003 I was diagnosed with breast cancer, and had cause to think what I wanted to do with my life! I was at that time a Trustee of a children's charity based in Glastonbury. I realised a long-standing dream was to make a real difference in the lives of children. After major surgery, while having chemotherapy, The Anne Harris Children's Fund was created. I realised I could not do this on my own. In addition to the support of my family, I discovered the power of friendship. So I am now part of a team, and every bit of help is valued. I hope that by being a friend to the Anne Harris Children's Fund, you will become a part of this team and know your support will be greatly appreciated and make a difference. I would like to extend my personal thanks to a number of people, without whom the Anne Harris Children's Fund would not exist. The objectives of the Trust are to improve the education and relieve financial hardship of children and young people suffering from any form of poverty, illness or disability, (nationally and internationally), as the Trustees may from time to time decide. The Anne Harris Children's Fund aims to be a highly visible organisation, operating solely to generate funds and distrubte those funds directly to community-based charities and non-profit organisations whose work is focused on children and young people. The fact that these organisations are based within a community means that they are in the best possible place to know what can benefit that community and how it may be achieved. We believe that children are our future, and that, as such, they should be nurtured and developed so as to fulfil their potential. We do not believe that we should focus solely on the children of the UK. We therefore aim to contribute to charities across the globe. We will keep our overheads to a minimum so that as much of the money we raise as possible is used to assist children. We would be interested to know which children you would like us to support. For a list of charities The Anne Harris Children's Fund intends to support, please see the beneficiaries page. 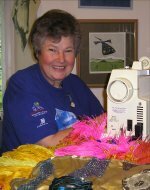 During the 1990's intrepid great grandmother Anne Harris took her hobby of kiting to the extreme; designing and creating giant inflatable creatures, using a domestic sewing machine. She was fortunate to be invited to kite festivals all over the world. When there was no wind Anne found she could inflate her creations using blowers. Abroad all kinds of blowers, including carpet blowers, were used! They were even inflated indoors. In 1995 Anne was first invited to take inflatables to the Theatre & Circus Fields at The Glastonbury Festival of Performing Arts. She also created a 120' high silver pyramid using layers of flags - however the crane raising this creation moved! She also created a 30' phoenix appliqué lit from behind which was also raised. This was to depict that pyramid stage, which had burned down the previous year would rise again in 1996. Anne continued to do bigger and bigger displays, made her first non flying inflatables – Merlin 33' high wizard, which featured in the film made of the Glastonbury Festival. Anne's last Glastonbury Festival as a performer was in 2004. The inflatables were also present at the side of the Thames near Tower bridge for the Millennium cerebrations. 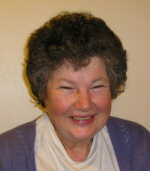 In 2000 Anne started a job providing night-care in a residential home for adults with complex care needs. She retired at the end of 2015. In 2003 Anne became a carer for her mother. This necessitated Anne and her husband moving into her mother's house. She cared for her mother until her death in 2015. The Cape Metal Health Society (CMHS) is a Cape Town-based charity committed to challenging socially restrictive and discriminatory practices affecting mental health. Mental health problems in Africa are highly stigmatised, and people who are living with such difficulties face discrimination and a general lack of understanding. These is especially true for children. Although CMHS is involved in projects that benefit people of all ages, the Fund is specifically interested in helping them to improve the lives of children who are living with mental health issues. Children's World aims to enrich the lives of all children, with particular focus on those having special needs. The Glastonbury-based charity's carefully crafted program of fun activities allows all children who participate to express themselves in a positive, fulfilling manner; enabling mainstream children to interact fully and happily with those having special needs, and to have tremendous fun while doing so. This will hopefully result in children growing up with a positive attitude to "disability." Although Children's World is a serious charity with serious aims, the key word in all their work is "FUN!" We accept donations made over the Internet. Online donations are made using PayPal. You do not need a PayPal account to make a donation. Donations can be made using MasterCard, Visa, American Express, Switch/Maestro, Solo, Delta and Visa Electron cards. PayPal members can also source money directly from a bank account. Clicking the "Make A Donation" button will transfer you to the PayPal website. You can also make a payment over the counter at any branch of NatWest Bank. Or you can send us a donation in British Pounds Sterling (GBP) to us by . Please contact us via to arrange a donation. To my husband Chris, for his never-ending and unqualified support. My children, Zoe, Tanya and Jonathan who will all be stewarding at Glastonbury in 2017, and help in many ways. My grandchildren, Kia, Zeff and Manni – who donated their pocket money when the Charity came into being. The children they most wanted to help were those "with no families and no money". "Barnado," a kiting friend and Barnado's child, who gave me £1000 for materials and will fund more materials if necessary. Jo, the webmistress, creator of, amongst others, the Merlin mascot image and general Devil's Advocate; all done free of charge. Thanks for the hundreds of hours. Avril, for invaluable Public Relations and event organisation skills; many hours given for nothing. Ros, Hazel, Sally and Robert for becoming Trustess; a big commitment and responsibility. All the Fund's Trustees work for a living and give of their spare-time generously. This website is © Copyright 2003-19, The Anne Harris Children's Fund. All rights reserved.